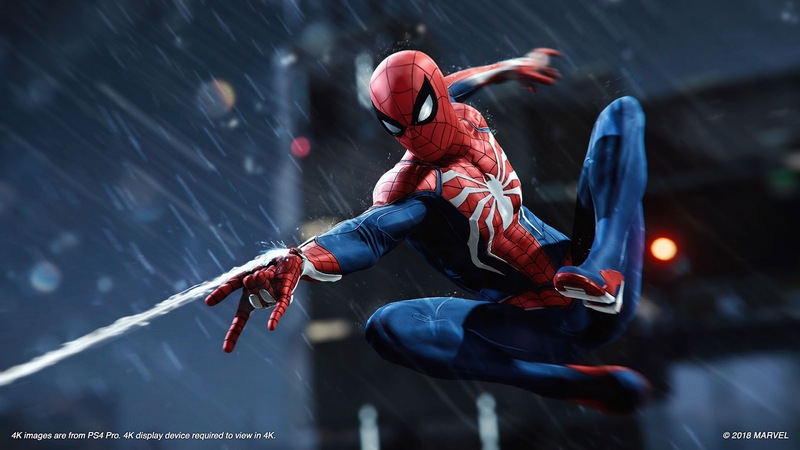 Marvel's Spider-Man, developed by Insomniac Games exclusively for PlayStation 4, is a highly polished version of the same Spider-Man games we've been playing for the last 15-years or so which means it is very good and easily the best Spider-Man game yet, but also that it has all of the same problems that every other Spider-Man game has while also introducing a few annoyances of its own. I'll repeat - Marvel's Spider-Man is excellent, but great feeling swinging doesn't magically forgive atrociously bad stealth sections, repetitive open world quest design, QTE-filled set-pieces, and Sony first-party games' trademark maze of upgrade materials and collectible nonsense. Marvel's Spider-Man is outstanding for as long as you are entertained by swinging around New York, but Batman: Arkham Asylum still stands as the best superhero game ever. Continue reading our full Spider-Man review for all of the details. to help support our site. This new Spider-Man adventure doesn't bother with an origin story and the death of Uncle Ben and rather follows an older, wiser, more experienced (but still dirt poor) Peter Parker who is still struggling to balance his heroic duties with his normal every day life. The story goes ... ah screw it. It's just like every other Spider-Man story. Blah blah blah, villains show up and New York City is in peril and Spider-Man has to stop it. 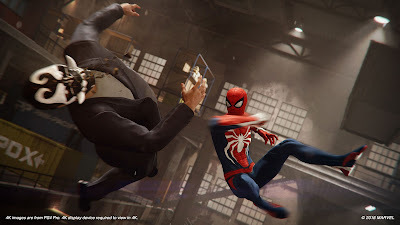 The first and most important thing about the gameplay is that the web swinging mechanics are absolutely sublime. Swinging is as simple as holding R2 to shoot out a web, swinging, and then letting it go at the apex of the swing to fly through the air before pressing R2 again to do it all over again. It feels freaking great. You have fantastic movement control while swinging, too, so you can easily slip through narrow gaps between buildings, make sharp turns around corners, honestly, do pretty much any other maneuvers you can think up. Smartly, the game also has parkour running built into the R2 button when Spidey's feet are on solid ground, so you seamlessly hurdle over air vents and other stuff on rooftops before launching yourself into the air again for another swing. By combining horizontal web zips to maintain your momentum, swings, landing for a split-second and immediately launching again, and other techniques you can soar around the NYC skyline with ease. And since they give you a dedicated zip to spot command, you can always land exactly where you want to. Swinging and movement in Spider-Man is just freaking outstanding and makes every other 3D Spider-Man game feel pretty awful in comparison. Unfortunately, Spider-Man isn't just about swinging around and eventually you have to actually do missions and this is where this new Spider-Man game stumbles into the same problems as all the rest. Frankly, goofing off in the open world is a lot more fun than doing missions. The missions have fail states so you have to do exactly what the game wants you to, as fast as it wants, or you fail. Missions are also full of big cool looking cinematic moments that you have no control over other than hammering out QTEs, which is super lame and frustrating when they just pop up out of nowhere so you fail them the first time. Almost every mission also falls into the "Go to X location and beat up waves of enemies", which gets old pretty fast. 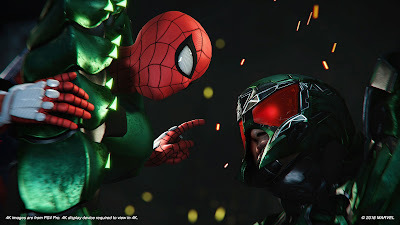 The combat itself is solid as it takes a page from the Batman Arkham series in that you have combos and Spidey-Sense to tell you when to dodge incoming attacks, and you also have gadgets like web bombs, electric webbing, and other things to toss in during fights. Different types of enemies require different combos and the game does a good job of mixing things up to make you use different tactics all the time. That's the idea, anyway, but since there are only a tiny handful of enemy types you fight over and over and over, the combat gets pretty boring after a while. For some reason the designers also thought it would be a good idea to force you to do stealth sections with characters other than Spider-Man and these sequences are abysmal. I suppose that, technically, they aren't especially difficult, but they also aren't any fun because the stealth mechanics are super rigid and bland like it's baby makes his first stealth game so you insta-fail if you get a toe out of line at the wrong time. "Hey, let's rip players out of this fun and fast-paced action game and make them sneak around!" - some guy that no one should listen to anymore. Even with some issues elsewhere, going back out into the open world and swinging around never gets old. For both good and bad, the map is full of collectibles to find. I think if this was a Ubisoft game people would complain about the collectibles (and there are also radio towers ...), but since it's a Sony exclusive people conveniently excuse them. Insomniac was mostly smart with the collectibles, though, in that you aren't just overwhelmed with a bunch of stuff to find right out of the gate and instead new items are added over the course of the game. This results in the collectibles being part of the normal gameplay flow rather than just a checklist of stuff to go find. Finding Peter's old backpacks with stuff from his younger days, tracking Black Cat on a crime spree (man do I love Black Cat ...), or capturing pigeons are some of the highlights of the collectibles. The pigeons in particular are fun because they really put your web swinging abilities to the test as you chase pigeons flying around all over. The presentation in Marvel's Spider-Man is absolutely phenomenal in every way. The game is totally gorgeous and New York City has never looked better in a game than it does here. The fact that you can go from the highest skyscraper down to street level (and even into some subway tunnels) without a hitch or stutter or pop in or obvious vision obscuring fog is simply amazing. The lighting and weather effects are great. The character designs are fantastic. The animation of Spider-Man is perfect. This game is stunning and incredibly impressive visually. The sound is also very well done with excellent voice work and a solid musical score. 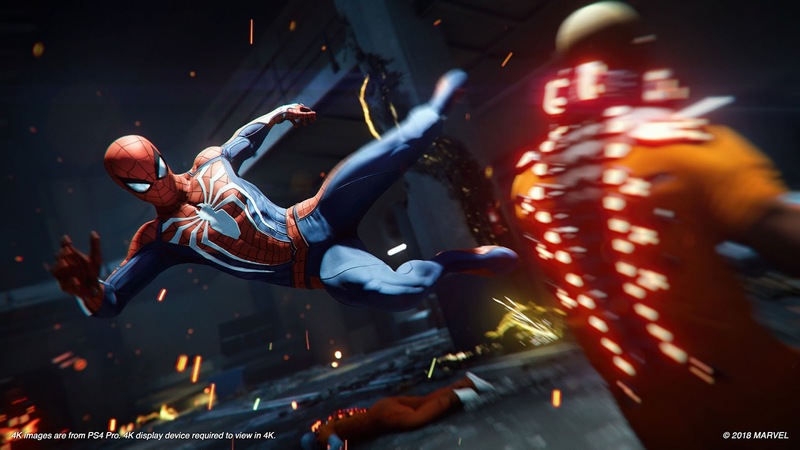 All in all, Marvel's Spider-Man is easily the best Spider-Man game yet, but it is more of a highly polished evolution of the existing Spider-Man formula than anything groundbreaking and new. That means that while every aspect is solid, particularly the swinging and general locomotion, it still falls into the same old problems of repetitive combat and mission design and obnoxious QTEs while introducing some new problems of its own with terrible stealth sections and a bloated upgrade system. The result is a game with sublime swinging but OK everything else. 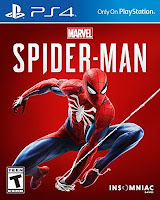 Still fun, still good, still absolutely worth playing, but also still behind Batman: Arkham Asylum (which is saying something because I don't really like Batman and love Spider-Man) in terms of best superhero game.